The memories of Tom's past cling to him like stale smoke from a long finished cigarette. Despite the years that have passed and the physical miles he put between himself and the hull of an apartment in St. Louis, where he left his mother and sister, the specter of that life is always hot on his trail. It thrusts itself upon him in unexpected flashes of clarity and visions of a painful realities. At other times, he is able to stomach it better and tread well worn paths through the familiar landscape, turning the events over in his mind as he wonders “what if” and attempts to justify his actions. 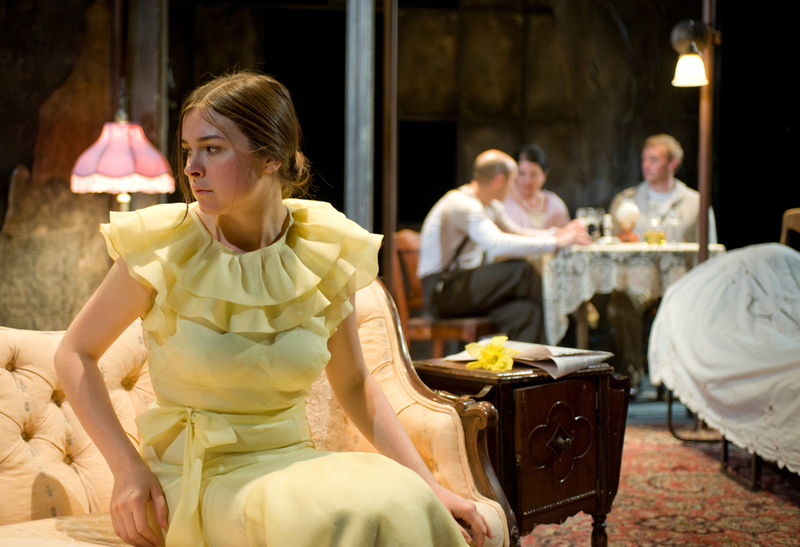 The lighting in the play reflects the dimness of memory. We begin the play with the apartment dark and dead. Tom, in complete control of the story, is the one who imbues the world with light. He shares with us the story and the partially formed memories. Isolated pools of lamp light interrupt the darkness, allowing the family to pass in and out of shadows. The apartment is cradled by the amber glow of factory windows. As Tom moves further into the story he loses control and gets pulled into it. These moments that are the most real and concrete, so light fills the space and the memory becomes tangible. It is inescapable and unbearable as he once again lives through the days that pushed him towards departure. The monologues are Tom's escape. Here he extracts himself from the action of the play and holds it at arm's length to observe it. He carefully constructs the world that we see, playing with words and crafting his memory while occasionally getting seduced by the romance of the period, only to be sideswiped by the dismal reality of the time. None of Tom's memories are delicate or precious. They are rough, smoky and dark. Only when we reach the end where Laura and Jim share a few precious moments alone, do we see something truly as beautiful and fragile as Laura's glass animals. She is the ghost that haunts Tom the most, and the evening with Jim is Tom's gift to her. They sit in the dingy apartment, swallowed by darkness, with only a single gas lamp to keep the shadows at bay.